I love to read, so when my friend, Ashley (Mixed Bag Ashley), told me about this website called Blogging for Books, I was hooked! I selected this book based on the title, since this is something I struggle with. It is so easy to get caught up in the comparison trap, especially in this day and time of social media's constant presence. I know I suffer from OCD (Obsessive Comparison Disorder) when scrolling through my Facebook and Instagram feed. This book called I'm Happy For You (Sort of...Not Really) by Kay Wills Wyma, addresses how to find contentment in a culture of comparison. To find out more about this book and the author, click HERE. been around since the beginning of time. In chapter 2, Wyma talks about how comparison began in the Garden of Eden with Adam and Eve. They had a wonderful life with all they could possibly want...until the tempter entered the scene and made them think about what they were missing out on by not being able to eat from the Tree of Knowledge. They were lured by the thing that they lacked....and needed, and we all know how that turned out. That's the thing about comparison, we don't know what we are missing, until we see it on social media or at a friend's house. Comparison lurks in the shadows, until we see a co-worker's new car or a Facebook post of a friend on a trip of a lifetime. This makes us feel like our life is not good enough. Can we ever be satisfied? Yes, I think we can; you just have to shift your focus. In the next few chapters, Wyma talks about how to change your view by using "The Glimpse." The Glimpse is when you see something from a far, like a family having a huge birthday party with inflatables at the park down the street, and you picture how great their life is. The thing is, that glimpse is just a moment, and you need to look at the big picture and consider what else could be going on in their life. Everyone has troubles and everyone has things that they can be grateful for. You have to focus more on the good things and less on the disappointments. It is sometimes hard to do this with the constant presence of social media causing us to feel that everything needs to be Pinterest-worthy in order to post it to our Instagram or Facebook pages. If you talk to your friends, I think you will find they feel the same way. Most of us are embarrassed if our house does not look like it belongs on the cover of Better Homes and Gardens, but the reality is that none of us live like that. The challenge. Wyma makes to us is to let go of comparison and stop worrying about what others think, because chances are they are worrying about what we think of them. I think instead, we need to encourage each other and take compliments gracefully instead of turning them into something negative. I will not give the rest of the book away, so you can read it! I think this book is applicable to people of all ages, because we all struggle with feeling like we do not measure up in some circumstance. Wyma uses faith based advice to help us combat the comparison problem. It has definitely made me look at my life differently, in that I consciously try to be grateful for the things I have. I also have been trying to be genuinely happy and gracious to my friends that have great things happening to them (instead of feeling jealous). 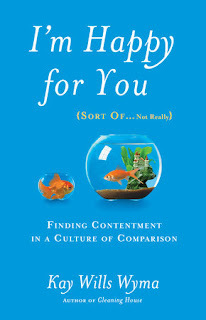 This book is a great read, so I hope you will check it out and join me on the path to contentment. Sounds like a good book. I often find myself comparing myself to others, or being envious of what others have (yes, I admit), but it's true on what you said, or the book said, about it taking away the joy. I hope one day I'll have the attention span to pick up a book again, lol. Yes! It is definitely a book that makes you think! You should read it sometime, when you have the chance!! Thank you Robin for checking out my post! It honestly is a great book and has helped me shift my focus when I am struggling with not feeling good enough.